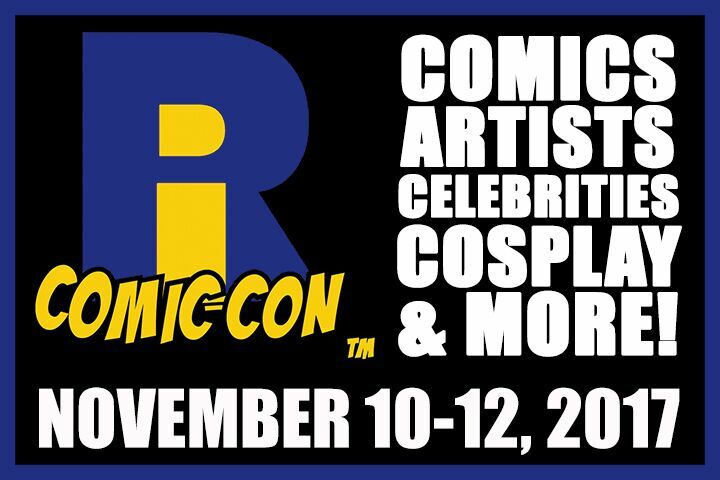 Initially it had been my hope to spend the entire 3-day weekend at Rhode Island Comic Con, interviewing celebrities and checking things out, but a family emergency came up at the last minute. In the final days leading up to the start of it I wasn’t sure I’d be able to go at all, but luckily I was able to squeeze one day out. That day was Saturday: the busiest and most crowded day of the three. Everything I’d looked at about the event before attending said that the doors didn’t open until 10 am. Rhode Island is usually close to a three hour drive for me, so I left my house at 7 am, thinking that would give me enough time for 1-2 pit stops. But, I hadn’t factored in the lack of traffic on Saturday mornings, and arrived at the convention center by 9:05. By the time I parked and figured out what door to go in it wasn’t more than 9:20 am. This left me wondering, would I be stuck out in the cold as I waited for 10 am to arrive, or would I be allowed in, and corralled somewhere to wait out the clock? It turned out I had nothing to worry about, since I had a press pass. Altered Reality Entertainment had thought of all of this, and allowed press entry to the venue before the general public. My one rule to follow for the entirety of the event was not to interview anyone who had “customers” at their booths. Easy enough, right? Once inside I began exploring. I’d never been to this convention center, never mind this convention itself. I had literally no idea as to the layout, which made things a little confusing at first. Once I found the main convention space I had a much easier time of things, and I still had 30 minutes to spare until the general public was allowed in. With those 30 minutes I interviewed three celebrities: Gates McFadden of Star Trek: The Next Generation, Robert Hays of Airplane! and Charles Fleischer of Who Framed Roger Rabbit. The first of the three, with Gates McFadden didn’t go so well. She gave me two questions, and not having prepared anything in advance I had trouble coming up with anything relevant on the spot. (You can listen to this very short interview here). The second, with Charles Fleischer went far smoother. We started out talking lip balm, moved on to dodecahedrons and continued on to discuss his role in Who Framed Roger Rabbit. Again, I wish I had more relevant questions, but overall this interview was better than the first. (You can catch this interview here). The third interview of the day was with Robert Hays, who plays Striker in the Airplane! films. Of the three direct interviews I conducted that day, this one was my favorite. It felt more like talking to an old friend, than it did an awkward discussion with a stranger. We talked briefly about Airplane!, and about his role in Sharknado 2: The Second One. We also discussed his son, and his love of music. Although I didn’t record the entire conversation, you can listen to what I got here. I spent the rest of the day perusing the main convention floor, during which I spoke to Bill Diamond’s associates. For those who don’t know, Bill Diamond is a puppet maker and has worked on some of the biggest puppet-containing-films in history. He’s made puppets for Little Shop of Horrors, Labyrinth, The Dark Crystal, Fraggle Rock, Seasame Street and many, many more. I had hoped to attend panels with the casts of Star Trek and Stranger Things, but by that time of day the lines were so long there’s no way I’d have made it in. Of the panels, I was able to get in to see one with John Cusack and one with George Wendt. The John Cusack panel was cut a little short because he had a plane to catch, and was entirely a question and answer period. And yes, I did ask a question. You can listen to the entire, slightly edited for clarity, panel here. On the other hand, the Wendt panel went the entire allotted time. This one was more directly hosted, and featured a “guess the line” segment, during which the host named episodes from Cheers and asked Mr. Wendt if he remembered his lines; a “story” segment, where Mr. Wendt described some of his favorite on-set moments, and an audience Q&A. Yup, I totally asked a question during this one too. You can hear the entire, slightly edited panel here. All in all, my first ever Rhode Island Comic Con experience was a good one. I had a great (but exhausting) time, and will totally be back next year. In the meantime, there are quite a few things I’m planning to do differently next year. For example, I am going to be choosier about which celebrities I approach so I can have more focused and knowledgeable questions prepared. I’m also going to pace myself a little better, and to plan which panels I attend more thoroughly. 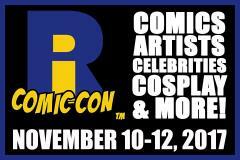 So, with that in mind, mark your calendars for November 9-11, 2018 and get ready for the 7th annual Rhode Island Comic Con!